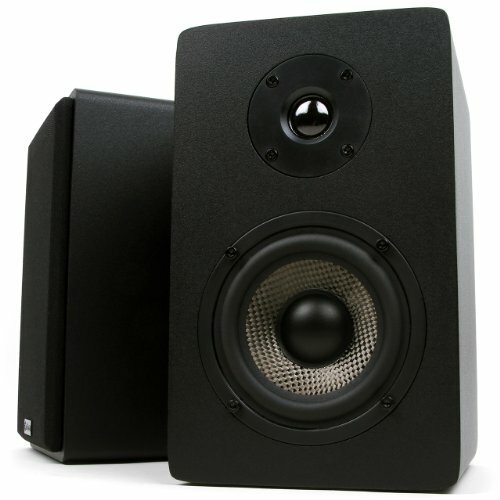 Sanus natural Series Nf24 is a 24-inch stand for medium bookshelf speakers up to 25 lbs. Its black-lacquered MDF base includes adjustable carpet spikes and screw-in polyester feet for stability. A solid hardwood pillar supports a 7.5 by 7.5-Inch top plate with adjustable-height brass studs and neoprene pads to provide superior isolation and resonance damping for speakers. Patented wire management channel conceals and protects cables. This product is sold as a pair. SANUS Natural Series NF24 is a 24-inch stand for medium bookshelf speakers up to 25 lbs. Its MDF base includes adjustable carpet spikes and screw-in polyester feet for stability. A solid hardwood pillar supports a 7.5 by 7.5-inch top plate with adjustable-height brass studs and neoprene pads to provide superior isolation and resonance damping for speakers. Patented wire management channel conceals and protects cables. This product is sold as a pair. The Sanus natural Series Nf36 is a 36-inch stand for small bookshelf speakers up to 25 lbs. Its black-lacquered MDF base includes adjustable carpet spikes and screw-in polyester feet for stability. A solid hardwood pillar supports a 6 by 6-inch top plate with adjustable-height brass studs and neoprene pads to provide superior isolation and resonance damping for speakers. A patented wire management channel conceals and protects cables. This product is sold as a pair. 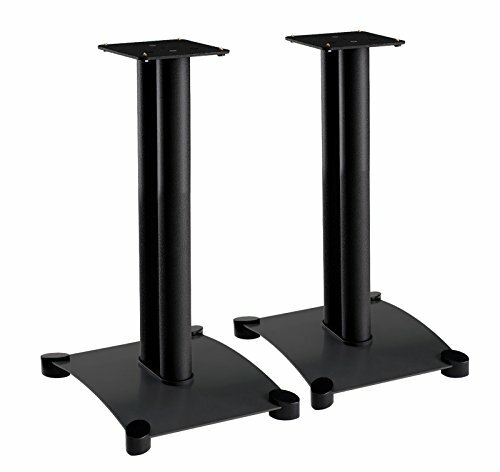 The SANUS Basic Series BF31 is a 31-inch black speaker stand for small bookshelf speakers up to 20 lbs. A solid, energy-absorbing MDF pillar supports a 5-inch by 5-inch top plate with neoprene speaker isolation pads for superior acoustic quality. ABS push-in carpet spikes add stability, and a built-in concealed wire path hides speaker cables for a clean and organized appearance in any room. This product is sold as a pair. The Sanus natural Series Nf30 is a 30-inch stand for small bookshelf speakers up to 25 lbs. Its MDF base includes adjustable carpet spikes and screw-in polyester feet for stability. A solid hardwood pillar supports a 6 by 6-inch top plate with adjustable-height brass studs and neoprene pads to provide superior isolation and resonance damping for speakers. A patented wire management channel conceals and protects cables. This product is sold as a pair. 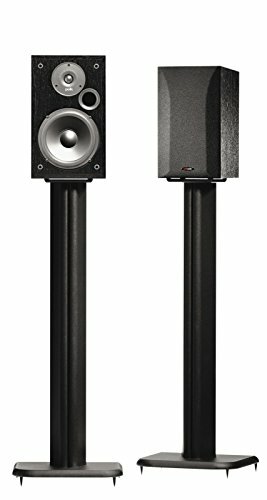 SANUS Natural Series NF18 is an 18-inch stand for medium-to-large bookshelf speakers up to 25 lbs. Its MDF base includes adjustable carpet spikes and screw-in polyester feet for stability. 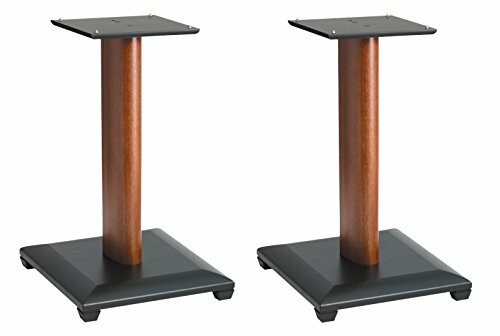 A solid hardwood pillar supports a 7.5 by 7.5-inch top plate with adjustable-height brass studs and neoprene pads to provide superior isolation and resonance damping for speakers. A wire management channel conceals and protects cables. This product is sold as a pair. 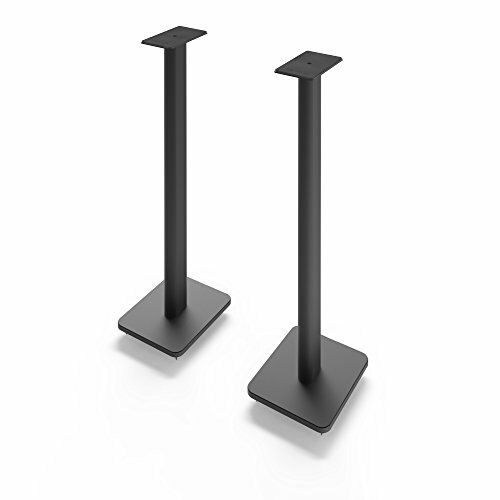 Sanus SF22-B1 Steel Foundation IV 22"
The Sanus steel Series SF22 is a 22-inch stand for medium-to-large bookshelf speakers up to 35 lbs. Its extra-large steel base includes optional carpet spikes for superior stability on any surface. Twin heavy-gauge steel pillars feature a concealed wire path and resonance damping rings that can be filled with sand or shot for added mass. The 8- by 8.5-Inch top plate offers brass studs and neoprene pads for speaker isolation. This product is sold as a pair. Get the most out of your speakers with the SP series. 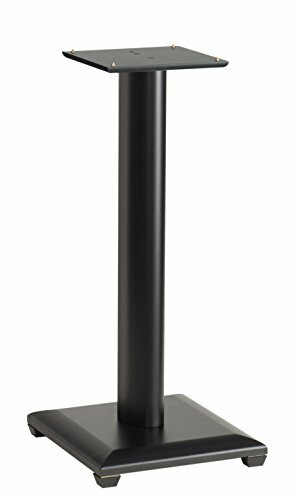 Available in 26 and 32-inch models, these low-profile speaker stands come equipped with a rotating top-plate to ensure every sound reaches your ears. Each stand includes a mounting hole and ¼" - 20 screw to secure your speakers in place. Their heavy steel structure helps to reduce undesirable vibrations, and features a hollow core to conceal cables and speaker wire. For stability on both carpet and hardwood flooring, every stand comes with interchangeable spiked and domed feet. Looking for more Wood Series Bookshelf Speaker Stands similar ideas? Try to explore these searches: Beastie Boys Merchandise, Orange Cocktail Ring, and Altitude Pant. Look at latest related video about Wood Series Bookshelf Speaker Stands. Shopwizion.com is the smartest way for online shopping: compare prices of leading online shops for best deals around the web. 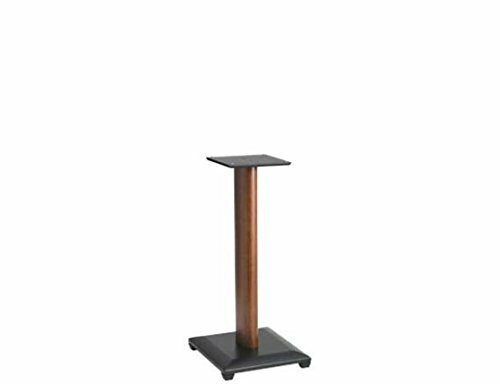 Don't miss TOP Wood Series Bookshelf Speaker Stands deals, updated daily.